If you don’t mind paying a little extra for good quality make-up, then you can’t go wrong with the popular brand, Benefit. Benefit are renowned for the quality of their make-up the world over. It may be a little more expensive than other brands, but as they say, you get what you pay for. This American company create an extensive line of make-up, from lip gloss, to blusher, to mascara, pretty much anything you could wish for. One of the best products within their line, is the Benefit Hoola Bronzing Powder. Bronzing powder is a great way to create some colour on your face, particularly if you have a pale complexion. It is better to wear a light coloured foundation, and use bronzing powder over the top, to give yourself the perfect look. Benefit Hoola Bronzing Powder is without a doubt, a very high quality product. 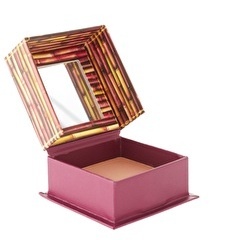 The box is compact designed, and packaged within the powder box is a small brush for application, and even a mirror. The bronzing powder is applied by using the soft brush to sweep across the face, to give it that natural glow, or you can use it to keep your features defined and glowing. This is a product which I would highly recommend. The colour is natural, and can be adapted to suit any complexion, just by being careful with how much is used. The powder stays packed within the box, unlike other brands I have used, where it seems to end up breaking off and going everywhere (just ask my carpet.) It also lasts for a long period of time after application, so you don’t need to keep re-doing it. Benefit Hoola Bronzing Powder is available from Asos and is priced at £23.50. For more information please visit the Benefit website.